This mobilization for the thoracic spine involves the palm placed behind the stiff thoracic segments of the patient’s spine, while the other hand is used to support the patient’s head and take strain off the cervical spine. For this mobilization, we’re using the heel of the palm as a fulcrum and taking advantage of gravity to help facilitate movement and get those stiff segments to move. Having the patient bring her arms up into flexion will help further facilitate extension of the thoracic segments, as the vertebrae naturally extends when the arms are brought over head. While the static mobilization shown in the first image is enough to aid in extension, this dynamic movement allows for a more effective mobilization. 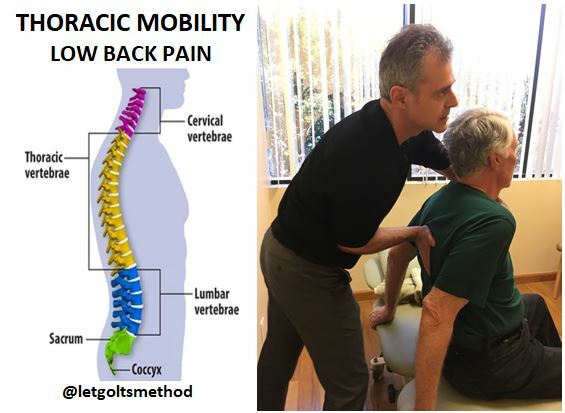 For patients who have exceptionally stiff thoracic spines and are more sensitive to something placed against the vertebrae to act as a fulcrum, this mobilization can be modified by having the patient on a sitting position. Dr. Letgolts can be seen pushing into the stiff segments (posteriorly -> anteriorly), while having the patient simultaneously lift up the chest and the chin. This action mimics the shoulder flexion that’s accompanied by thoracic extension. Apart from chronic low back pain, one of the other common complaints our patients have is chronic neck pain. When the t-spine no longer moves well, the c-spine will compensate by working even harder to produce the same movements necessary to bring the head up so we can look forward. Most of this translates to excessive hinging at the C7-T1 junction, where the cervical spine (neck vertebrae) meets the thoracic spine (upper back). Over prolonged periods of time this gets overworked and eventually, the strained C7-T1 junction will get stiff as well, since it isn’t meant to undergo that about of stress. As the desk life becomes more prominent and people spend more time in front of a computer screen or on their phones, chronic neck pain becomes more common as well. Our positions during screen-time can exacerbate the symptoms, as more strain is put on the neck to support the weight of the head when it juts out beyond the shoulders—this strain increases as the head tilts further forward. Therefore, it’s important to understand that the position we spend our time in for prolonged periods will certainly affect our symptoms. However, that’s not to say neck pain is caused solely by “bad posture.” It has more to do with the inherent anatomy and structure of one’s bones, but more on that later. 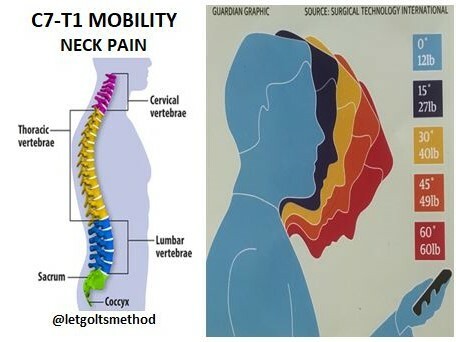 The key to relieving most cases of chronic neck pain starts with the mobilization of the C7-T1 junction, so the head can be positioned back over the shoulders. This removes a lot of the additional strain put on the neck, as the compensations for stiff joints is removed and the head is able to rest properly on the spine for support. Here we can see the active mobilization of the C7-T1 junction, where the patient is participating in the mobilization. As Dr. Letgolts pushes with his thumbs on the stiff segments in a posterior –> anterior direction, the patient lifts her head and chest up to help facilitate extension of the thoracic spine. One of the most common complaints our patients have is chronic low back pain. We treat this in our clinic by addressing the body’s compensation patterns. The path of least resistance is a concept applicable to many fields and physical therapy is no different. Since the entire body is connected, it shouldn’t be a surprise that one area of the body can affect another. In other words, if a movement involves junctions A, B, and C, and one of those is stiff (e.g., B), then the other areas (e.g., A and C) will compensate by working even more to produce the same movement. 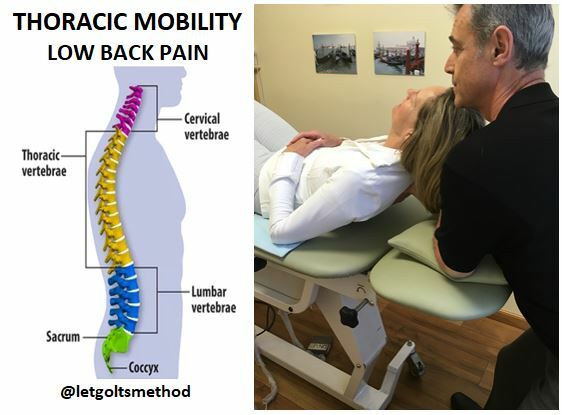 A common contributing factor to low back pain (LBP) is the mobility of the spine as a whole. When the thoracic spine gets stiff and doesn’t move as well, movement will occur in the areas above and below. In other words, the lumbar spine will be forced to move more than it normally does due to thoracic stiffness. Over prolonged periods of time, that excessive movement and stress on the lumbar spine causes LBP. 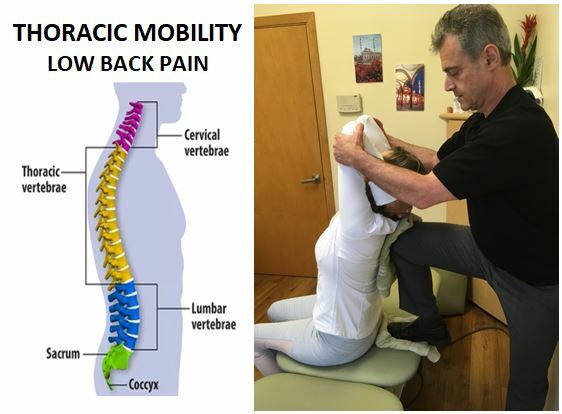 In order to alleviate some of the strain on the low back, the thoracic spine can be mobilized such that the lumbar spine won’t have to compensate for that immobility. Dr. Letgolts can be seen here mobilizing a patient’s upper back. Extension of the thoracic spine can be facilitated by placing the knee against the stiff segments and pulling on the patient’s raised elbows. Once those segments move better, the lumbar spine no longer needs to compensate. Given that the thoracic mobility is maintained, the low back pain should be alleviated. The wedge is often used by professionals to mobilize—i.e., crack—patients’ backs. However, wedges can also be used for self-mobilization. This is a variation of the foam roller mobilization that was posted on Wednesday. For patients who have especially stiff upper thoracic spines, the wedge offers a more aggressive alternative to self-mobilize with when compared to the foam roller. 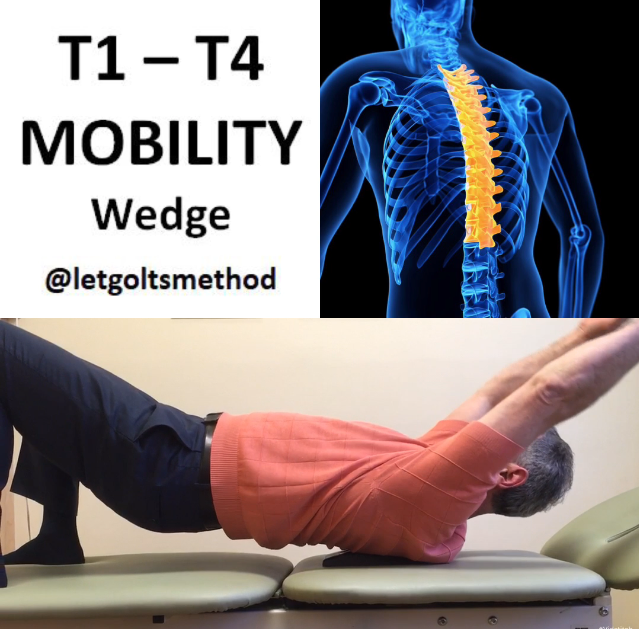 Since T1 – T4 are very hard to mobilize on a foam roller, using a wedge also allows for a more specific placement of a fulcrum, to target those segments that get stiff. Move the arms up and down 10-12 times. The up-and-down movement of the arms combined with the wedge acting as a fulcrum helps further mobilize the thoracic vertebrae as the t-spine naturally extends with flexion of the arms. Suffering from low back pain or neck pain? 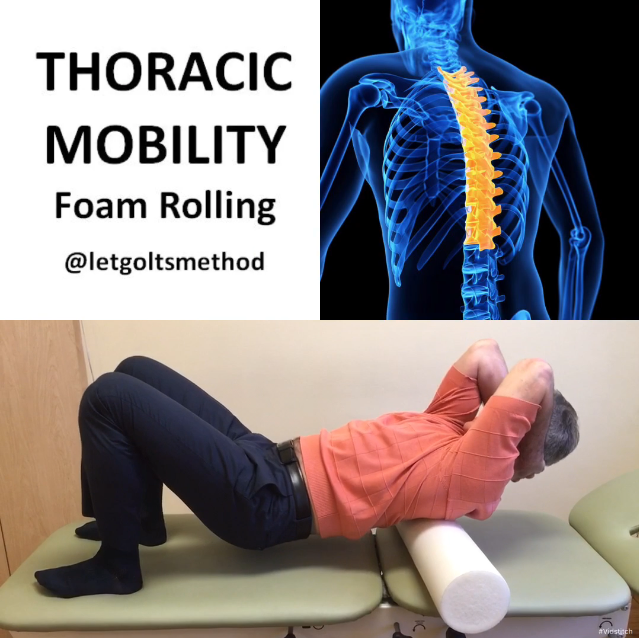 Mobilizing your thoracic spine on a foam roller may help! This is one of the most common exercises we teach our patients to help them improve and maintain their thoracic extension. As you move higher up, the foam roller may start to slide. You can avoid this by lifting up the hips to get a better placement on the foam roller. Feel around for those stiffer segments and spend more time on those areas! Keep the stomach tucked in and the abs tight to help prevent extension from the lumbar segments to get the most out of this mobilization!